As the water temperatures rise, the trout will be searching for more food after the long winter. Once you find a hatch, you can generally catch a lot! You’ll know it when a hatch is on; it is like watching the river boil as trout rise to eat, and often times it feels like standing in a storm of bugs. Your best bet to catch fish is using a single fly preferably an Elk hair Caddis, Goddard Caddis or an X-Caddis. If there are a lot of bugs on the water using a larger fly and a little different color than the actual caddis flies will make your fly stick out more. Also, concentrate on a single fish and try casting your fly so it floats right into that fish’s feeding lane. Spring is a favorite fishing season for locals; fewer people, which gives you more room to cast a fly and the weather is starting to get warmer. But be prepared the weather can change to a small snowstorm or rain very quickly, so be sure to pack an extra layer. Although “Mother's Day Caddis” is known for the Caddis hatch, you can also find action with Baetis, (Blue-Winged Olive or BWO), March Browns, and Green and Gray Drakes. This is the time of year you can begin to actively strip streamer patterns. Basically, the catch is on! Early morning and late evening are best for dry fly fishing, but it’s not out of the question to see some afternoon hatches. Nymphs and streamers are great when the water is clear, which can be hit or miss depending on the weather and runoff. There are a number of rivers around Bozeman. If one is running dark, it doesn’t mean they all are, so check around. Generally, you’ll find the spring creeks fishable. Though they often require a rod fee, so plan ahead. 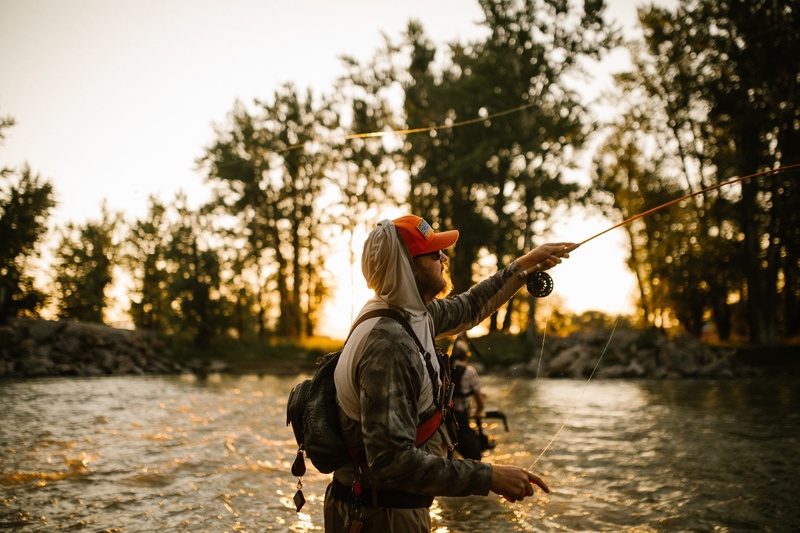 The west and east Gallatin are best for spring fishing in Bozeman around early May, weather depending, but will fish well again after the main runoff. Often times, it is clearer west of Big Sky, near Yellowstone so be sure to scope that area out. The Yellowstone River can run high depending on runoff, but when it’s floatable the best area is around Livingston and Paradise Valley. Nymph and streamer fishing starts to come alive on the upper Madison, but for the real crème de la crème in dry fly fishing, the lower Madison near the Bear Trap is where the best Bozeman dry fly fishing happens. Now back to Mother’s Day. As we mentioned, fishing is loved by both men and women, so just because your mom hasn’t tried it, doesn’t mean she won’t like it. As long as she’s game, make your fishing excursion into a family outing, complete with a picnic, relaxing chairs and perhaps a good book.